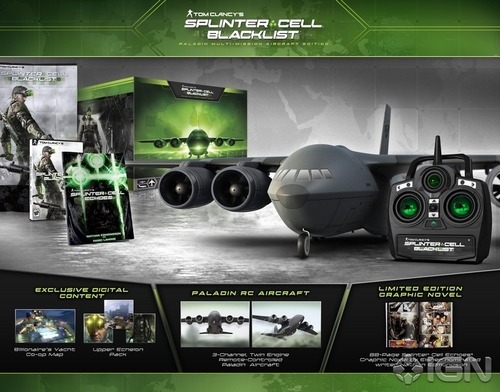 Ubisoft has announced today that Splinter Cell: Blacklist will be getting a special collectors edition.The Paladin Multi-Mission Aircraft Edition will launch alongside the standard edition on August 20th fro the Xbox 360 and Playstation 3 and will cost $169.99. This edition will include a copy of the game, a 88-page Splinter Cell Echoes graphic novel, a poster, the “Billionaire’s Yacht” co-op map, the Upper Echelon Pack containing the “Dead Coast” co-op map as well as the Gold Sonar Goggles and Upper Echelon Suit in-game items, and a radio-controlled version of the Paladin airplane that Sam Fisher and his Fourth Echelon team use as their aerial base of operations. THQ is Now Officially Dead. Who Will Carry on Their Legacy?